Editor’s Note: This review is reprinted with permission from Real Estate Appraiser Tips. Please see below for details on how to win a free custom-built appraiser blog by author, appraiser and social media expert Bill Cobb. With the many challenges before the residential appraiser these days, it’s important to remain on the FHA Roster- the ticket that can provide 40 to 50 percent of your income going forward. Here’s one way to help improve the quality of your FHA work. It’s no secret that 2010 could be a very challenging year for home appraisers due to less demand for appraisal orders. However, where certain sectors are diminishing under the current mortgage market conditions, FHA and USDA Rural Development (RD) appraisal orders are booming. RD appraisal assignments require FHA standards and inclusion on the FHA Roster. FHA work is expected to remain a large portion of mortgage lending into 2010. A Coester AppraisalNewscast in late December last year stated that as much as 60 percent of home loans made in 2009 were FHA. A recent 2010 HousingWire Update email stated that four out of 10 home loans are FHA. Whether FHA lending makes up 40 or 60 percent of mortgage lending in 2010, it seems certain that it is a necessity for appraisers to remain on the FHA Roster. Why is it important to “up your game” when it comes to FHA appraisals? It was reported in 2009 that, due to FHA loans defaults, FHA reserves dwindled below one percent, causing the Wall Street Journal and others to question FHA’s survivability. It’s my understanding that FHA is increasing scrutiny of appraisals in an effort to remain solvent. Recently, Bloomberg reported that: “U.S. Subpoenas 15 FHA Lenders with High Mortgage Defaults” (January 12, 2010). And, you can bet that FHA will look at who the appraisers are that possibly helped those 15 lenders earn their high default status. FHA Appraiser Inspection Course, Checklist and eManual! On Real Estate Appraiser Tips (my blog filled with tips for working harder on your business, rather than in your business), we try not to get bogged down in the news of the day but offer tips and solutions to get us beyond our challenges. After reading through the FHA Inspection Course, eManual and using the Checklist in the field, I’m convinced that the use of the Checklist will certainly aid in reminding us not to forget any inspection items while onsite and consequently, remaining on the FHA roster by not committing careless errors. For instance, one item I repeatedly forget to take note of is how far the private sewer or water well is located from the home and to properly annotate the locations of such on the sketch. The Checklist reminds me to do this. Another reminder is to include photos of the crawl space, which is something I often forget to do. With the elimination of the old “VC Sheet” in 2005, FHA inspections may not be as thorough as needed simply because of a lack of a checklist to follow during inspections. This product solves that problem for appraisers. A helpful feature of the eManual is the real life photo examples of possible FHA deficiencies with questions and discussion as to which answers are correct and why. FHA lessened some standards in 2005 after it lost so much mortgage market share but this resource answers the extent of “current” FHA standards concisely. “This new FHA Appraiser Inspection Course, Checklist and eManual is designed to get you up to speed on FHA appraising,” said appraiser-author Lore DeAstra. “The course explains how to complete the two-page checklist line by line. The Checklist serves as a field guide for completing your reports. The eManual saves you time and money by summarizing and organizing the material you need to know. We reviewed more than 450 pages of HUD materials and spoke with several HUD officials to compile the FHA Appraiser Inspection Form, course materials, and eManual. It will save you time and money.” (No continuing education credit is available at this time). 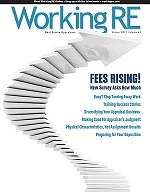 If you have questions for Lore DeAstra regarding FHA appraising that you would like answered, please email them to subscription@workingre.com.